H.E. José Guillermo ORDORICA ROBLES joined the Mexican Foreign Service (MFS) in 1993 and he serves in his current position in Bucharest since January 2018. Within the MFS, he held numerous responsibility positions including those of Director for Africa and the Middle East, Deputy Director General of the Matías Romero Diplomatic Training Institute, advisor to Secretaries of Foreign Affairs, and Director for the Political Affairs Department at the Embassy of Mexico to the Holy See. He also had numerous diplomatic assignments in international forums such as the Organization of American States (OAS), the G-6, the G-8, the Rio Group 1999 Summit and the 2002 International Conference on Financing for Development. Prior to embracing diplomacy as a full-time job, he had an academic career, in which, among others, he contributed to developing internationally the MA program in Mexico-US Studies of the Universidad Nacional Autónoma de México. He is fluent in English and Italian, and he also studied French and Swahili. 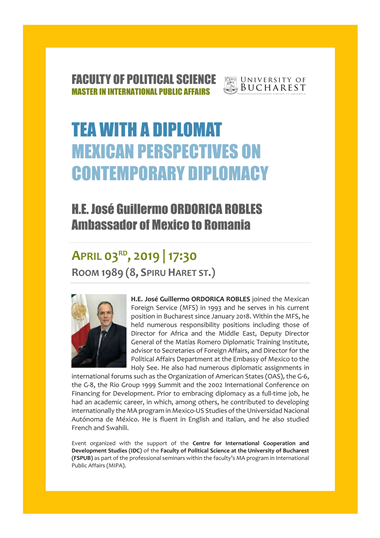 Event organized with the support of the Embassy of Mexico in Romania and the Centre for International Cooperation and Development Studies (IDC) of the Faculty of Political Science at the University of Bucharest (FSPUB) as part of the professional seminars within the faculty’s MA program in International Public Affairs (MIPA). The event takes place in English and it was designed for students of the MIPA program. FSPUB students specializing in international affairs outside the MIPA program may also attend.